Cargo volumes handled at the terminals of JSC Sea of Port St. Petersburg in the first quarter of 2015 rose 5% compared to January-March 2014 to 2 million tonnes, the port operator said in a press release. The three-month volume includes 1.6 million tonnes of general cargo and 400,000 tonnes of bulk cargo. The 5-percent increase in the reporting period was driven by handling metals. Thanks to increased steel exports by Russian metallurgical enterprises handling of ferrous metals at the port rose 8% to 597,000 tonnes. Increased aluminum exports in the first quarter pushed non-ferrous metals volumes up by 22% to 396,000 tonnes. The port operator handled in the three-month period 83,000 tonnes of rolling cargoes, or 38% below last year's figures. The decline was primarily due to shrinking volume of imported cars following a slump in the Russian car market. In H2, 2014 Sea Port St. Petersburg started handling food commodities and in Q1 the port moved 25,000 tonnes of this cargo. The volume of mineral fertilizers handled at the port's terminals shrank by 27% to 186,000 tonnes, following the shift of the commodity traffic to dedicated terminals in Russia and the Baltic countries. In the reporting period exports flow (accounted for 85% of the port operator's total throughput) through terminals increased by 6% to 1.7 million tonnes, imports (15%) - by 4% to 300,000 tonnes. 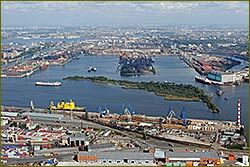 JSC Sea Port of St. Petersburg (part of UCL Port, a stevedoring division of UCL Holding) is the largest port operator offering services for handling all types of dry cargo in Big Port St. Petersburg. The company operates modern dedicated terminals handling Ro-Ro cargo, automobiles and metals. In 2014, the company's cargo throughput reached 8.1 million tonnes. Business news archive for 16 April' 2015.
Business news archive for April' 2015.